Paul Barden Roses: From the photo library: Ralph Moore's quest for the crest. From the photo library: Ralph Moore's quest for the crest. 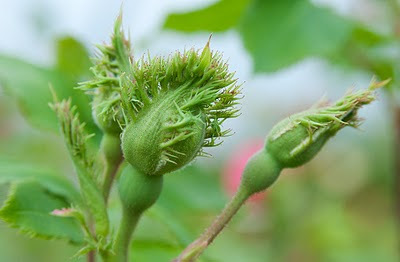 I found this great photo of buds of Ralph's crested breeder, C-04. It is a back-cross of Crested Jewel onto Little Darling, its momma. This is a very dwarf plant, to two feet, and lacking vigor. It does, however, bloom like as mad thing, and passes the cresting on to offspring. But the offspring are invariably weak plants with very poor vigor and zero disease resistance. I keep it as a novelty and a reminder of the good old days with Ralph and Carolyn at the nursery. Kim; Paul; both are great stories. The crested buds are nice to view, too bad they haven't panned out in breeding. I enjoyed your stories, too, guys. It's a cute thing.